When it comes to helping gay students prepare for life after college, few of the nation's institutions of higher education earn top honors in providing them with relevant resources to aid in a successful job search upon graduation, a new survey finds. Of the 109 colleges surveyed, just 6 percent of career centers at those schools earned a top rating by OUT for Work, a Washington, D.C.-based advocacy organization for lesbian, gay, bisexual and transgender college students. The purpose of its survey is to gauge the career tools, programs and resources applicable to LGBT students through campus career centers, the group says. OUT for Work founder Riley Folds says that his organization has been conducting such surveys since 2005, gathering the data by polling attendees to its annual conferences. "Generally, on average, every year about 80 percent of the students say that they never had any career-specific tools and resources provided to them," Folds tells AOL Jobs. But not every LGBT student can attend OUT for Work's annual conferences, so the organization began looking at how it can gauge whether colleges are providing the kind of information LGBT students need by surveying career centers directly. Based on their responses to the annual survey, career centers are given an A+Gold, Gold, Silver or Bronze certification. Gauging college career centers' effectiveness is important, Folds says, because many of today's LGBT students are out and active within a LGBT campus community, unlike their predecessors of, say, a decade ago, who tended to remain in the closet. Though many LGBT college students today find college campuses to be welcoming places, that may not be true of the workplace, leaving many in the dark about what to expect at their first jobs. LGBT grads may find their assumptions further challenged by geography, should they move to a new state in their search for work. They may find themselves on unfamiliar and perhaps unwelcoming turf, he says. "In some states you can be simply not considered or fired or not promoted just because of your sexual orientation or gender identity." All factors being equal, he says, LGBT students generally gravitate toward employers with inclusive employment policies and cultures, he says. The recent downturn in the economy, however, has resulted in many LGBT graduates accepting the first job offer that comes along, irrespective of how inclusive an employer may be. Emily Berk (pictured at right), a University of Maryland senior who's studying computer science, says the tips she learned at a recent OUT for Work conference were invaluable. Those included sessions on networking skills and how to ask pertinent questions of potential employers. More importantly, says Berk, 22, much of that insight she wouldn't have gotten from her college's career center. The school has some resources, she says, "But it's not as good as it could be." Berk does credit the staff with knowing that LGBT students face distinct issues when job searching, such as how out to be on a resume. Still, she says, "They didn't give me examples of when it's been helpful, they weren't really able to direct me to places where I could find LGBT-friendly [employers]." 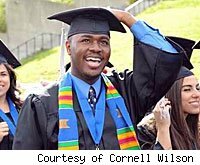 Recent Ithaca College grad Cornell Woodson (pictured at left) says a lack of career center resources wasn't an issue as he was winding up his bachelor's degree because he is confident in his own sexuality. "It almost seemed to come natural," he says, adding that it's imperative for him to work for company that accepts who he is. 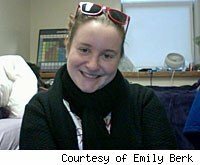 The 24-year-old University of Vermont graduate student concedes, however, that many young LGBT people aren't as in tune to their sexual identity and likely need help to determine how out they should be when presenting themselves to potential employers -- whether that's via email, a resume or in person. And that's where students' college career centers should be helping, Woodson says. "The role of the career-service center is making sure that they are connected with organizations that [have non-discrimination policies] and have a welcoming environment." Though just 6 percent of college career centers surveyed earned OUT for Works' top rating, Folds says the trend is positive, with several colleges achieving higher scores in 2011 compared to a year ago. And that, he says, is progress. 86.5 percent of the career centers surveyed provide tools, resources, information and/or advice to students on finding LGBT friendly employers. 37.5 percent of career centers at community colleges provide students with information about "coming out" on a resume. No career centers at historically black colleges or universities surveyed were yet found that perform outreach specifically to the LGBT student population. Video Extra: Rep. Tammy Baldwin, D-Wis., talks about coming out on the job at OUT for Work's 2007 National LGBT and Ally College Student Career Conference.